As Eventide’s first pitch-shifter - and the world’s first digital rack effects unit - the H910 Harmonizer® carries with it a rich history. From Tony Visconti’s infamous declaration that it “f*cks with the fabric of time” (and his use of the H910 on David Bowie and Iggy Pop’s landmark Berlin-era albums) to Flood’s Depeche Mode recordings to Laurie Anderson’s experimental pop, it’s an effect that has made its mark on a variety of records and genres. When we set out to accurately model the H910 as a plug-in, we knew we had to do it justice at a component level. The behavior of the H910 plug-in replicates that of the hardware unit in precise detail - including a number of features that aren’t immediately visible looking at the virtual faceplate. To get the lowdown on the H910 modeling process, I spoke to Eventide DSP engineer Dan Gillespie, who spearheaded the H910 plug-in project. DA: What exactly did the modeling of the H910 involve? DG: The H910 is interesting, because while it is one of the first digital audio effects, the ability to do things digitally was still in its infancy and so much of the signal processing is analog. This includes the input and output stages, the feedback stage, saturation, DBX companders (compressors and expanders), and filtering and analog sections of the A/D and D/A converters (analog-to-digital and digital-to-analog). So we really approached this part of the product as an analog modeling exercise doing in-depth analog models of these components, building SPICE models, and testing to find out what had the most important effects on the sound - and where we could break circuits apart. The A/D convertors themselves are discrete devices designed by Tony Agnello leveraging an earlier design created by Richard Factor for the DDL1745. Because the H910 is not a purely digital device and predates any standards for digital audio sample rates, it works by running the D/A converters at a different sample rate than the A/D converters, depending on the pitch shift ratio. This creates changes in system bandwidth depending on the setting. The clock that generated these sample rates was also susceptible to drift which is a key factor in creating the pleasant chorusing sound it became famous for - represented by the visual drift in pitch shift ratio on the GUI display. Then finally, the pitch shifting algorithm itself is really different from the type of time domain pitch-shifters you might normally write in software. 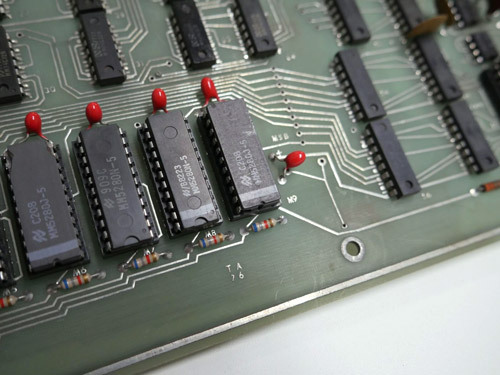 I believe this is because the H910 didn't have any microprocessor and instead was implemented via discrete CMOS logic gates and shift registers. Tony thought about it slightly differently than you might as a C++ developer or even in assembly code. It turns out that this had a significant effect and definitely adds to the uniqueness of the sound. Tony was the original designer of the H910, and having his insight was incredibly important to the modeling process. Even still, the model ended up in development for over a year - but the H910 is a signature Eventide piece, so we really wanted to make sure we got it right. DA: Can you explain what the DBX companders are? Why are they needed at the input and output stages of the unit? DG: Early A/D and D/A converters, even the best ones, didn't have a lot of dynamic range, with the end result being audible noise and distortion. Before early digital, tape also suffered from the same problems, so it became common practice to use some sort of compander setup to increase the effective dynamic range of a medium like tape. A company called DBX (David Blackmer eXperiment) invented several technologies for doing this and licensed them to tape machine companies and eventually to Eventide for use in the H910. The companders in the H910 are analog modules which work by using a dynamic range compressor before the A/D converter and its complementary dynamic range expander after the D/A. They serve to reduce some noise and distortion you would otherwise hear from the digital processing in the H910 (internally it's 11 bits!). DA: Can I hear the companders in the plug-in? Theoretically, if the compressor and expander are perfect complements of each other and you don't do anything that would affect the envelope of the signal in between them, you wouldn’t hear the effect of the companders. However, we are doing stuff in between the compressor and expander, so this is where it gets interesting! You'll definitely hear the effect imposed by the companding if you send a signal through the H910 even in Delay Only mode. By changing the Input Level knob you'll be able to vary the effect as well. Ultimately, the companding becomes even more of a factor once you start shifting the pitch and adding feedback. Luckily for us, DBX was smart when they developed these things so even when their performance as a noise reduction device degrades, they add a very pleasing effect. DA: What's up with the time glitching in the plug-in? DG: A classic case of a bug becoming a feature, it was an integral part of the original H910. 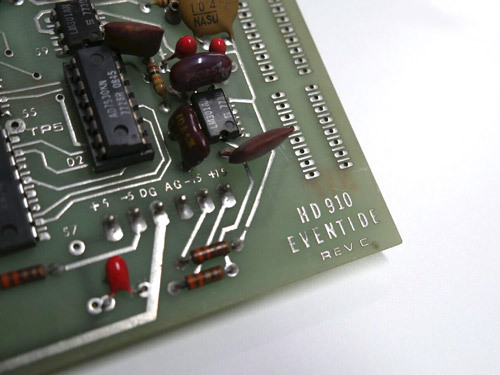 The next pitch shifter created by Eventide was the H949, which added proprietary circuitry developed by Tony to get rid of this glitch. But the glitch is nice, and one of the things that sets it apart from most modern pitch shifters. DA: What exactly is "anti-feedback"? DG: Anti-Feedback was a special mode in the H910, where it would oscillate the pitch shift ratio relatively quickly. The intent was to allow someone speaking into a live microphone to still be intelligible while eliminating any feedback into the live microphone. This would allow the PA system to be louder without feeding back. However, musicians also soon learned that this mode could be abused to make some very odd sounds. DA: How did sample rate and bit depth differ when the original H910 was made? DG: Since the H910 was built before digital interface options, the sampling rates and bit depths were up to the designer. 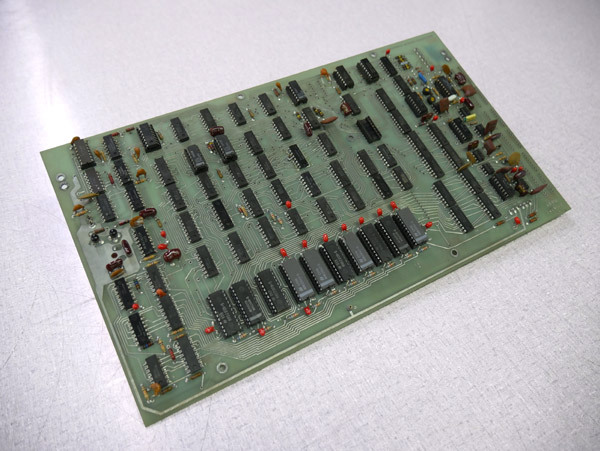 The H910 is actually 11 bits internally, which is about as much resolution as the A/D could handle and why the companders were added to create a high fidelity machine. The input sampling rate was set by the A/D converter though the output sample rate was dependent on the pitch shift ratio, causing the bandwidth to change depending on the shift amount. When not writing about plug-ins or posting on Eventide's social channels he can be found cheating on one DAW with another.